Earlier this year, Oxfam reported that the world’s eight richest people control roughly the same amount of wealth as the bottom half of the world’s population. Around the same time, the World Economic Forum identified income inequality as the most challenging problem the world faces today. It is an issue that has been discussed for decades, but in the wake of political upheaval in the U.S. and Europe from voters hurt by globalization, there is more intense interest in creating a less polarized distribution. In this interview, Nobel Laureate Robert Shiller of Yale and Wharton finance professor Jeremy Siegel discuss how the income distribution gap became so wide, and they offer possible solutions. Shiller also notes that one of the big challenges to future income levels may be artificial intelligence and robots, and he suggests some ideas on how to prepare for that eventuality. Knowledge@Wharton: The topic of income and wealth inequality has gotten a lot more attention since the Great Recession began in 2008, which was followed by one of the slowest economic recoveries in modern times. The Great Recession just made the statistics about income and wealth inequality even more skewed. The topic then seemed to go mainstream this year when the World Economic Forum at Davos noted that rising income and wealth inequality could be the most significant trend in world economic development over the next 10 years. Their report had input from 700 experts. So there is more agreement today on the size and importance of this challenge. A couple of notes about our guests: In addition to being awarded the Nobel Prize in Economics in 2013, Professor Shiller’s book, Irrational Exuberance, which was a New York Times bestseller, warned about a stock market bubble, which burst shortly after the book was published in 2000. The dot-com boom turned into the dot-bomb bust. And he correctly pointed out that the nation was in a housing bubble a few years later that could lead to a deep recession, shortly before the 2007-2008 financial meltdown. Professor Siegel also correctly called the top of the tech bubble in 2000, warning about high valuations in the sector. He is the author of the classic Stocks for the Long Run, which argued that stocks have been giving a real return of about 7% for almost two centuries, and thus are a solid investment over the long run. He has been consistently bullish on the equity markets since the time of the 2008 crash, and the Dow has gone from about 6,600 in March of 2009, to above 20,000 today. Professor Siegel also appears regularly on CNBC, CNN, NPR and many other TV and radio shows, to offer his views on the market. Let’s start the questions. Professor Shiller, do you agree that rising income and wealth disparity is one of the world’s biggest challenges, including, of course, in the United States? Robert Shiller: I’m worried about the future, that if the trend continues, it could be the biggest problem we’ve faced. 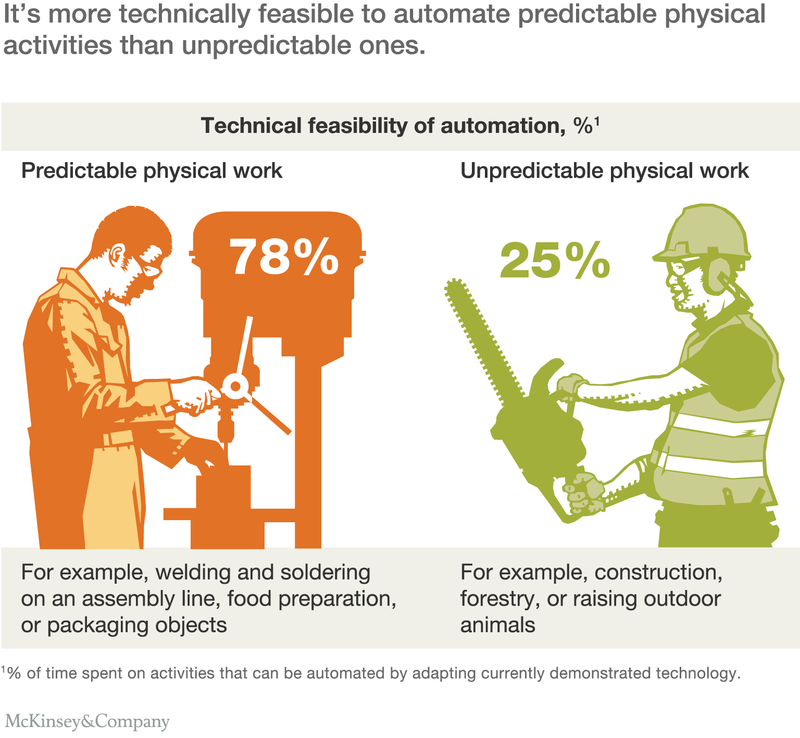 … I’m worried that technical progress, robots, will be replacing common labor. And so is the World Economic Forum. They paid a lot of attention to robotics at the Forum. When I was there this January, they had some impressive new robots. It’s moving fast. And it’s eliminating jobs. It hasn’t been a real tragedy yet, but it could be in the future. Knowledge@Wharton: Are you suggesting that the disparities are a problem now, but that the problems may accelerate because of robotics? Shiller: The problem is that robotics is on the verge, it seems, of replacing many basic functions that labor performs now. There are so many examples. This Christmas, a lot of people got their Google Home, or their Amazon Echo — Alexa. And it’s like there’s another person in your home. If you bought one of these, you can talk to her. You can ask her to put on some music. To control something around the house or to order something. This is now. The question is, we just don’t know where it’s going. And the worry is that it will eliminate any source of income for some people who can’t do much more with their labor than these things that are being replaced. Knowledge@Wharton: Professor Siegel, what’s your view? This is a problem that’s been brewing for decades. And now Professor Shiller is suggesting that it’s going to accelerate because of robotics. Jeremy Siegel: I think we need to separate out several forces. One is the growth of productivity itself overall. And the other is the fact that we’ve had a tremendous falling behind of the lower-income groups relative to the upper-income groups over much more than 20 years — 30 years. Now, to some extent, I think there is a relation. But we have to understand that relation. What worries me as the greatest problem — as a long-term factor — is the collapse of productivity that we’ve had across the board since the Great Recession. Non-farm productivity growth used to be 2.3%. Higher in expansions, somewhat higher when oil prices are going down. We had a big expansion since 2009. We had oil prices going down. And it’s 0.5%, 0.6%. We’ve never had it so low. And if we just had it normal, we would have wages up by 10% to 12% today, which is significant, compared to what we do see. Knowledge@Wharton: Is it also true the percentage of benefits from productivity increases that go to labor have diminished quite a bit? And is that a problem? Siegel: Yes. Well, that’s a problem of, why has it diminished for labor, mostly? I think there are several factors there. And we could certainly go into those with Bob, if you want. But I could start it out, if you’d like. Knowledge@Wharton: Why don’t you give the headline ones, and then, Professor Shiller, please weigh in. Siegel: I think some of the lack of a rise in productivity growth and real wages in the working class sector and below has to do with globalization, and the tremendous increase in the supply of labor worldwide that we’ve seen over the last 20 years. I also don’t think our educational system is providing the right sort of training for people coming into the job market in the 21st century. I think our school system is falling down on producing those sorts of workers. There are certainly other factors, and Bob might bring some up, and we might talk further on this. Shiller: Well, you were asking me what am I most worried about. And so, worries tend to be about the future. I’m actually chiming in with a worry that Norbert Wiener, in his famous book on cybernetics [Cybernetics: or Control and Communication in the Animal and the Machine, first published in 1948], aired in that book. I can’t quote him exactly, but [the idea was] that computers may replace just about anything that ordinary labor can do. And then, what do they do? What jobs are there for them? Now, he’s been very controversial ever since. And it hasn’t happened yet. Because the people on the bottom half of the population are seeing their income stagnate but not decline over the last 30 years. So it hasn’t happened yet. But you were asking for big problems. You were citing the World Economic Forum, and what people there were citing as a problem, and that’s a future problem that may not even happen. You know, we don’t see the future very clearly. Jeremy is pointing to some current problems. And the slowdown in productivity growth is a puzzle. And of course, education — yes, I agree. Education could improve the situation currently. Knowledge@Wharton: So, what would be some policies that might help to alleviate some of this? It sounds like with the robotics issue, it’s difficult to say because we don’t know when it might hit or how big it might hit, or exactly how it will hit. So, that’s definitely a big challenge. But Jeremy, with the items that you cited: Are there some things that we could do, policy-wise, as a nation here or other parts of the world, that would ameliorate a lot of this? Siegel: Well, first of all, the fact that the labor market — the working man, so to speak, who depends more on his physical labor, less on a skill set so we would call that “unskilled labor” today — I don’t think we made good provisions for these people who really lost during the global expansion. Now, this is certainly one of Trump’s issues. There were some little plans that were done. But I think we needed to do more because this was a huge social issue. The other thing is, again, preparing people for the right type of jobs. You know, our educational system — we used to be number-one in the United States in the 1960s. Now, on international comparison tests, we’re number 30, 35. We’re in the middle, below some developing countries. This is an embarrassment for our country. And just in teaching — you look at a program of learning in Germany from 1880, and it’s almost like, you go to mathematics. You go to grammar. You go to these little courses. This is not the right way, I think, that we need to teach our students to get the jobs of the future. Knowledge@Wharton: So, there are two points there. One is that not enough was done for the people that were left behind. Would you say that policies such as retraining could have helped with that a little bit? Siegel: Now, that’s a good question. And many of them were resistant. They were older. When you are older, you’re more resistant. There’s always a choice of trying to go on disability or Social Security when you’re not really that disabled. We had a much bigger fraction since 2009 go on disability and Social Security than all our projections were showing. We had a much faster decline in the participation of the labor force than most of our projections were showing. So, that shocked the system and accelerated what was going on, and pinpointed the problems that we were having. Knowledge@Wharton: On the education side — it’s easy to say this, but obviously, you have to figure out where funds would come from — but is the implication that we need to invest more, at all levels of education? Siegel: I think we do. And I think we do need to, at all levels, for the bright people and for the people who had fallen behind, and the people who need retraining. And then they have no one but themselves to point to when they drop out, when their good job of 30 years has disappeared. Knowledge@Wharton: Professor Shiller, your problem [regarding robotics] is a little thornier in the sense that, I think what you’re saying is, we’re not really sure what the outlines of it are. It looks like it’s heading our way, but we’re not even sure about that, and we’re not sure about what it would look like. So, how do you prepare for that kind of a problem or challenge? Shiller: Well, yes. What I’ve emphasized here is that we already do have a system in place, somewhat, that helps deal with inequality. It’s our progressive tax system, and our welfare and Medicare, Medicaid, Social Security. So, these are already there. There don’t seem to be plans to make them stronger. And it appears that, historically, countries that face rising inequality do not adjust these in-place systems toward redressing the problem. So, there’s a recent book by Scheve and Stasavage [ Taxing the Rich, a History of Fiscal Fairness in the United States and Europe ], who argued through a history of data from many countries, to look at what causes taxes on the high-income people to go up? And what causes redistributions to low-income people to go up? You might think rising inequality does that. But they said that’s not it. The only time our system becomes more progressive is war time. When we’re fighting a war, people become much more concerned about low-income people. And for some years after that there will be a more progressive system. But it doesn’t respond to inequality. So, I think that one thing I’d like to see is plans made ahead for what we will do if inequality becomes worse, much worse than it is now. And it would be a plan within maybe even the framework of these existing systems, to adjust the way benefits are defined, to adjust the taxes on the wealthy. But it would be a contingency plan made now. And it has a better chance of happening if it’s done in advance. It becomes much more of an insurance. You know, you have to insure your house before the house burns down. So, we should set up a system to deal with the possibility of higher inequality in the future now, before it happens. Nobody is doing this. I’m saying we ought to. Knowledge@Wharton: Strengthening the social safety net — I think that is what you’re saying. Would it mean, for example, that if a worker was displaced because of cheaper labor overseas, or displaced by a robot, and was unable to find a job, or unable to find a job anywhere near what they were earning, that there would be some sort of a guaranteed income? Or would they have guaranteed health care they otherwise might not have? What would that look like on the ground? Shiller: Well, we already have something like that. It goes back to the 1960s, and more notably to the beginning of this century. It’s called trade adjustment assistance, which has been incorporated in a number of bills that have passed Congress and were signed by the president. So right now, you can apply for trade adjustment assistance, to a state agency in your state. You have to make a case that your job was taken by a foreigner, [according to] what it says right now. President Obama, in his State of the Union address in January of 2016, argued that we should expand that into what he called “wage insurance” that protects wage-earners, whether or not they can prove that they lost their job to foreign competition. He didn’t get it. But that would have been a movement. It’s along the lines that I’ve been arguing. Knowledge@Wharton: Jeremy, you did say that there should have been more done for people who were displaced by some of these global forces, which they had no control over. Do you agree with Professor Shiller’s take on this, about what kinds of policies could help? Siegel: Well, I’m not as enthusiastic about tax redistribution. I want to create more opportunities. I want to really train people into their jobs. Distribution opportunities could come from so many different directions. And I would prefer that route. Our tax system, of course, is already progressive. Bob has noted that it’s not all that progressive, when we actually get down to the data about how much income has increased. And that’s probably so. But there just doesn’t seem to be a good response to handouts. And the rest of those people doing it, or who feel that it’s taken from them and going somewhere else, do not feel ennobled by that form of gift, so to speak. So, I want to concentrate on the training, and on the education, and really rethink: What is an undergraduate education? What kind of skill sets are we giving them? Because we see so many of them having a hard time getting a decent job. And, you know, that should not be [happening] with the unemployment rate at 4.7%. Knowledge@Wharton: Would this include a measure that would reduce the amount of tuition that colleges charge today, for example? Siegel: Oh, that’s a big problem. Because I think that was a terrible bill. Knowledge@Wharton: Which bill, just to be clear? Siegel: Well, the bills that gave the Pell grants and everything else, that eventually led to “free” outside [private] loans for college education. I think, honestly, everyone seemed to have a win-win. The colleges, the loan officers. But now, we see a lot of losses. These people are not graduating with the skill set. They’re not getting the jobs to pay off their loans. And the flaws of that are coming home to roost. I’m not an expert on what to do about that situation. But I feel that what has happened was because of a flawed system. Knowledge@Wharton: Earlier, you had said that we would need to increase investments in education at all levels. Presumably that might mean measures that would not just change the curriculum in colleges, but would also reduce the cost. Is that right? Siegel: Well, certainly we can reduce the costs — but that we need to change the curriculum to be more practical for most people. There are only a few people that really gain a tremendous amount by [studying a] purely liberal arts, so to speak, curriculum. Especially if they took out a loan to go to college. They want a good job afterwards. And I think we need to form these community training schools, or whatever. That’s what we need to do. Knowledge@Wharton: Professor Shiller, what would you say are the main constraints or barriers to moving forward with some of the ideas you were talking about just a little while ago? Shiller: Well, Jeremy hit it on the head. People don’t want handouts. And maybe, yes, when you campaign on taxing the rich, and giving the money to the poor, even the poor — they have self-respect and they don’t vote for that. On the other hand, if it can be framed properly, it represents something that isn’t viewed as a handout. So, one of the examples is education. If we give free education to poor people, that doesn’t sound like a handout, does it? Or to their children? But it is a redistribution. If somebody is paying for it, it must be paid for by higher-income people. And we have that. And Jeremy’s right, it could be improved. Siegel: But they’re not getting the jobs. That’s what I’m saying. They’re not getting the jobs that former students and graduates got. The average wage of the graduating students has gone down. And it’s because of the great increase in those students — it’s supply and demand. And I think that’s one of the factors. Shiller: The problem is that education might not do it. … I’m worried it’s not going to solve this problem. We’re going to have great social unrest, because a lot of people are just not doing well. Siegel: Well, I think part of what we’ve seen in the Trump election, Brexit, and all that, is an uprising reflecting some of that problem. The question is, is it going to accelerate? I still basically believe that productivity growth is a very good thing. And it does increase the opportunities. But if it’s focused just on a very narrow set, that brings about a problem. People ask me, and you brought up, Bob, robotics, and how fast our workforce will deplete. I like to give the following example. I would like you to comment on it, because I respect your views so much. Primitive man basically spent all his life hunting for food, and finding minimal shelter for his family, or his companion, and for him to raise a family. That was eight hours a day. Now, with wages in developed countries, that same minimum set, I heard, is 45 minutes to an hour a day. Now, you’re not going to get foie gras and truffles — but [you will get] a minimum set of nutrition, probably even better, and minimum set of standard living. Which means that we work over seven hours on just our own enjoyment above and beyond that. That’s the history of mankind, over the last thousand years or so. And that’s resulted in about an 85% elimination of what was the standard job. Bob, what do you think? Shiller: Yes. That is definitely a good thing, no question about it. And it’s worked out fairly well. We have less need for that. And in fact, society has already made adjustments. What I think is really striking is that it’s basically in the last century, that we’ve seen people retiring, and then spending the rest of their life not working. The median age for retirement within our Social Security system is 62. The life expectancy of people is about 80. So, that’s like 18 years of vacation. Siegel: Yes. We never had anything approaching that — that’s unprecedented in world history, that’s correct. Shiller: I think we’ve adjusted to it. We have Social Security. We take care of these people. I mean, they can enjoy good food. It may not be — Social Security is not so generous that you eat foie gras. But you can eat much better than your caveman. … I think that we’re going to see a lot more leisure in the next century. And maybe we’ll find some meaningful things to do. The problem is, people need a feeling that they contribute. That they’re working. We have to find some way to make sure they’re not starving. They’re not left out. And that they have found something meaningful to do. And I’m hopeful that they will.